Updated 6/2/2017 Slayers Next!, Episode 4 ("An Ancient Pledge! One Who Seeks Immortality!"). This impressive pan sketch shows Halsiform (Halcifom, Halshifom), the Dorian Gray type villain of the early episodes in this story arc. He’s made a pact ensuring himself eternal youth so long as the object that contains his life is unharmed. In their first showdown, Lina Inverse temporarily incapacitates Halciform by encasing him in a block of ice. This sketch shows the result; another shuusei (see thumbnail) shows the outlines of the iceberg that (for the moment) keeps him out of action. 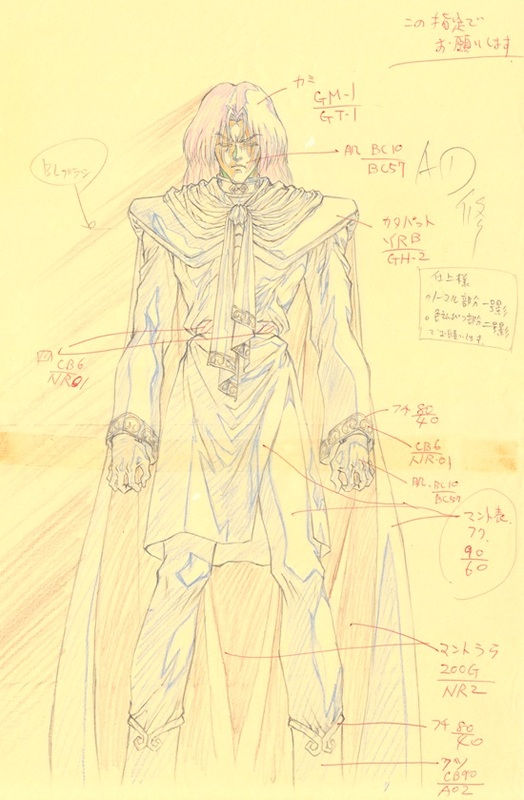 Animation director for this episode was Atsuo Tobe [戸部 敦夫], who probably executed this impressive shuusei genga. Tobe was animation director for two episodes of Slayers and for four of Slayers Next, plus doing storyboarding and gengas for others. You can see another example of his work for this series here. This artist later supervised Ep. 23 of Hyper Police, and you can see an example of his sketchwork on this series here. 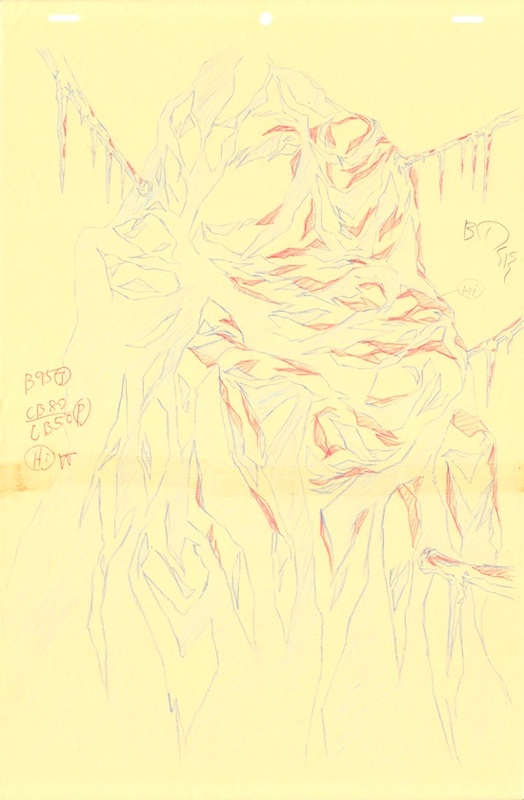 Tobe also worked on Inuyasha, and you can see yet another example of his sketching for that project here. Later he served as character designer for Yakitake Japan! and as Animation Supervisor for the 2008 supernatural action series Kekkaishi. Look at the fine details in the clenched hands. The detailed notes indicate the specific paint colors for the indicated body and costume parts. The boxed note to the right under "A1 shuusei" (correction) reads, "To the finisher: [bullet] for the normal part - Grade One shading. [bullet] for the colored pencil part - Grade Two shading. Please follow this." Trivia fact: Halciform was voiced by Kazuhiro Nakata, a seiyuu with a long resume of monsters, demons, and baddies, including Fei Wong Reed, the big boss at the conclusion of Tsubasa Chronicle.